If you found this blog, you probably have your own ideas in mind already. Maybe your company needs more onsite storage. Maybe your team needs a safe place to bunk. Or maybe you’re looking to copy Europe’s latest luxury hotel—a completely portable, high-style shipping container that’s migrating across first-class tourist destinations. In their original form, shipping containers aren’t much to look at. But they clean up pretty well. 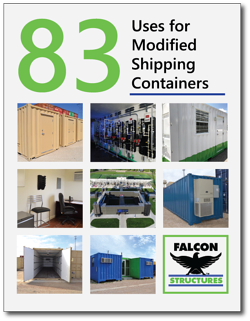 At Falcon, we can help you choose and modify the best containers for your needs—whether you want to incorporate climate control, advanced security features, kitchenettes, custom paint designs, or other custom add-ons. You won’t believe how efficient shipping container homes and portable offices can be until you discover all the different professionals who are using them: ranchers, restaurants, schools, major corporations, and even government agencies. If you want to see modification in action, check out a few of our shipping container case studies. Meanwhile, download the full list of container project plans: 83 Uses for Steel Shipping Containers. These are all great ideas. What’s yours?